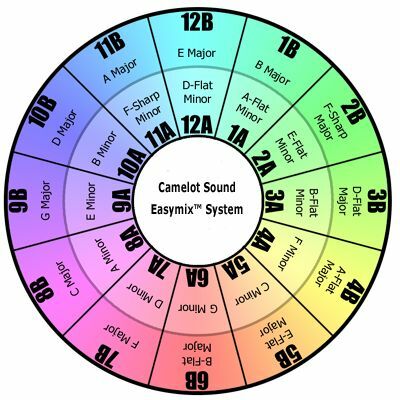 In camelots easymix system each key, minor and major keys a total of 24 keys has been assigned a special code, a keycode. If you remember that each key is compatible with the 5 and 7th step key in either direction(chromatic scale) you will understand how the easymix system works. This system is based on the circle of 5th, you can read about that here. So basically how this works that with each keycode you can mix with the same keycode with the number below or above. So 5A will mix perfectly with another song in the tonic key (5A) or 4A (perfect fourth) and 6A( perfect fifth). Just remember that the "B" codes are major keys and "A" codes are minor keys. You can also look at the camelot wheel as a clock, mixing songs with 1 hour ahead, 1 hour behind or at the same hour. Remember that Camelot offer exellent service for bpm and key info, using musicians rather than software for finding the key. Subscribing to their services you will for sure get 99.9% correct data. To dig deeper into harmonic mixing and understanding scales and key signatures I encourages you to check out this site.